So originally this week the plan was to make some sort of savory bread pudding dish. I wasn’t quite sure where I was going with the concept, but it’s been getting colder and some comforting carb-y casserole seemed like the way to go. But as I was debating, I remembered I still had egg noddles in my pantry from the kugel experiment, and how I’d said I would try to make a non-dessert-like kugel. So, that’s what I did! Cook the egg noodles until just shy of al dente (or, if you are me, until they are done). Drain and stick back into the pot. Add the butter and let it melt into the noodles, stirring so all the noodles are covered in butter. In a large bowl, beat the eggs. Mix in salt, pepper, kale, and cheese. Add the apples, and noodles and mix the whole thing together thoroughly with your hands – try to get the kale and cheese evenly distributed. Add the milk while you mix. Stick in a baking dish and bake, covered for 30ish minutes at 375. Serve warm or room temperature. This was really good!! The egg kinda ended up on the bottom creating a sort of egg-y base, but it was still quite tasty. I was skeptical that I had used enough cheese, but it ended up working out extremely well. Yay!! All in all I’d call this recipe a major success, and both cheese and kale complimented the apples surprisingly well. Song of the Week: Sing by Pentatonix. I finally broke down and bought the new Pentatonix album! I was actually going to go with “Can’t Stop Love” but I’m kinda obsessed with Sing. It’s so uplifting and anthemic, and makes me feel awesome about life. So listen to it and feel good! Measure flour and salt into a bowl. Using a pastry cutter or a fork, cut in the butter until there are no significant sized lumps. If compressed, the dough should almost be able to stick together. Add water, a little at a time, until the dough comes together. The dough should be soft and pliable, but cohesive and not sticky. Cover with plastic wrap and set aside. After you’ve made the dough, roll out a circle large enough to cover the brie. 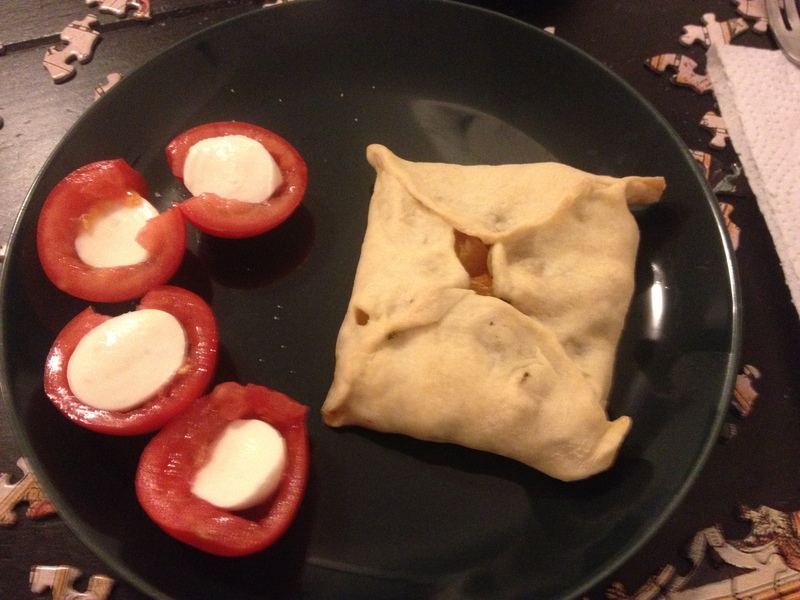 Place the brie in the center of the dough. Spoon some honey on top of the brie and then sprinkle the rosemary on top of that. Fold the dough so the brie is fully encased and bake at 375 for 15-20 minutes. 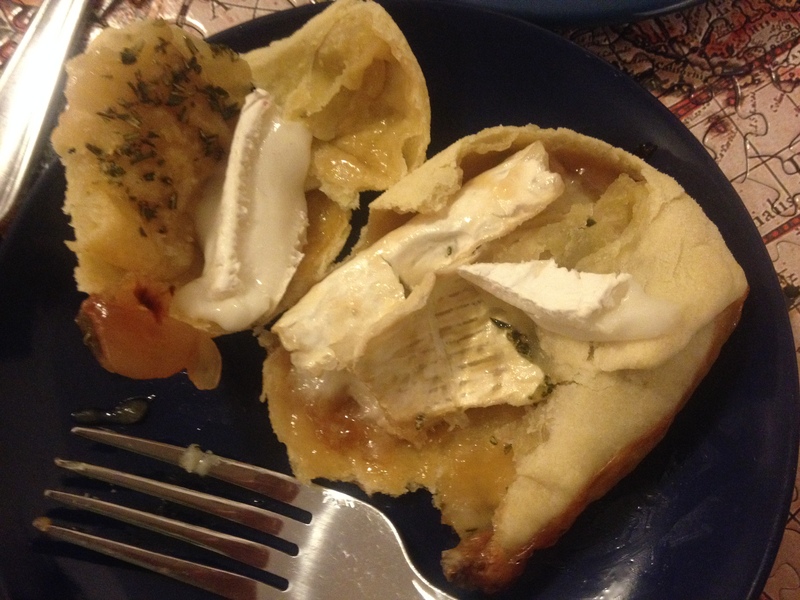 So – what happened to me was when the Brie melted, it found a hole in the pastry and spread all over the baking pan, where most of it burned, leaving mostly a shell behind. So I cut it open, sliced a little more brie and stuck it on while the pastry was still hot so it’d melt a bit and drizzled a little more honey on it. Which worked extremely well and was ultimately a perfectly yummy snack with some red wine, a Tempranillo in this case – which worked really well. So, how do you avoid my mistake? Use a wheel of brie, with a rind all the way around rather than tempt fate with a wedge. Also, the honey doesn’t stay on top of the brie the way jam does, so you might want to cut out a circle of the top rind and place the honey there. And make sure there aren’t holes on the sides or bottoms of your dough. All fairly obvious things to do really and yet… Song of the week: Schadenfreude from Avenue Q. Self-explanatory given my weekend I think.